Offering you a complete choice of products which include capsicum, fresh pomegranate and grapes. Capsicum in addition to use as spices and food vegetables, Capsicum species have also been used as medicines and lachrymatory agents. They fight free radicals, boost the immune system and also have an anti-inflammatory effect on the body. 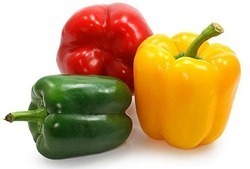 One carotenoid in particular – beta-carotene – is used by the body to make vitamin A, which is critical for good eyesight, bone strength and skin health among other things. The pomegranate is a fruit-bearing deciduous shrub or small tree in the family Lythraceae that grows between 5 and 10 m tall. The fruit is typically in season in the Northern Hemisphere from September to February, and in the Southern Hemisphere from March to May. 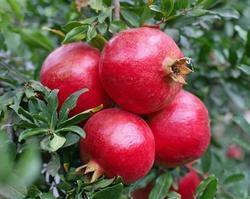 The pomegranate arils (seeds) are also very sweet, with one cup containing 24 grams of sugarand 144 calories. Various varieties like thompson seedless, sonaka etc are available in bulk. Packaging Details: Plastic Crates and Thermocol boxes available in various sizes.